【SMALL AND COMPACT】High efficiency, simple, easy to operate it. This pico projector is no larger than an iPad mini. Easy to install and then you can enjoy the movies with your family right away. When not in use, it doesn't take up much space. 【CONNECTS TO OTHER DEVICES】You can connect via HDMI to a laptop, desktop computer, or DVD player. Use the devices you already own to project videos, photos, and more. This mini video projector also has super sudio and vidieo decoding. 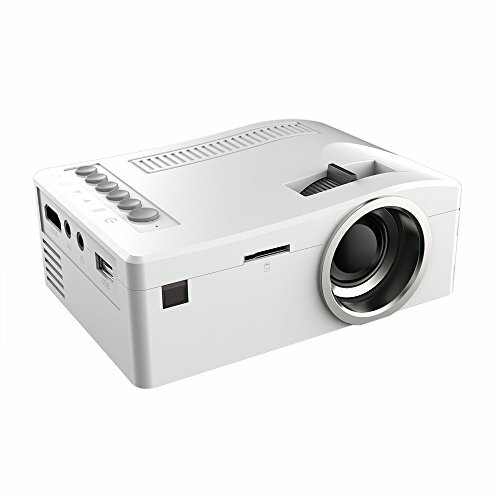 【 HIGH RESOLUTION PROJECTOR WITH TRUE COLOR ENHANCED TECHNOLOGY】Support input Resolution 1080p. (MAX) This mini video projector features a 320*180 Native High Resolution with the latest True Color Enhanced Brightening Technology. 【 HOME ENTERTAINMENT REDEFINED】The new model has an upgraded LED bulb and makes less notice, making the pocket projector a great choice for a portable home entertainment system. Ideal for Home Theater Movies, Video Game, Recommend Using in Dark Environment! 【 100% SATISFACTION ASSURANCE】For professional technical support please don't hesitate to contact us. We take pride in our products quality and we provide one year warranty. P.S this UC18 400lm 1080P Projector comes with a FREE AV Cable,and a FREE Remote Controller.Thank you for choosing Fosa.